The results of the Newcastle v Nottingham Forest player ratings by fans. Wednesday night was a shocker and I think these ratings from fans fairly reflect that. The top rating is actually given to somebody who was only on the pitch for the final eight minutes of the normal 90. Salomon Rondon (6.3) came on and showed a bit of purpose, which was more than pretty much anybody else had done, then scored a very good goal. Of the starters, Federico Fernandez (5.1) top scores and did his best to hold the defence together. As an Argentine international and Premier League regular, he looks what he is, a dependable tried and tested defender who will do ok. He was subbed before that late shambles of the final two goals occurred. After that, only three others of the starting eleven score 4.0 or higher, with the inexperienced younger players Longstaff (4.8) and Sterry (4.5) sticking to their tasks in difficult circumstances. Joselu (4.1) the other one, he have plenty of effort and had one header that maybe he could have done better with, but the service to him was atrocious. At the very lowest end of things, Kenedy (1.8) had a very similar experience to what happened at Cardiff, regularly losing the ball and nothing going right when trying to go forward. Was at fault for the first and third goals. Christian Atsu (2.2) is showing absolutely nothing this season so far and gave Newcastle no help going forward, needs to step it up. The other five starters were poor to below average, with Karl Darlow very lucky to get away with a couple of poor attempts to deal with crosses and shots. Schar (3.8) struggling at the back, Ki (3.8) running around a lot in midfield but getting nowhere, Muto (3.7) a similar story up front. Ciaran Clark (3.1) looking uncomfortable as he ended up playing kind of left-back for much of the game. All in all, a desperate picture of a team that played without inspiration or any real purpose, fringe players doing nothing to convince they should be starting in the Premier League. 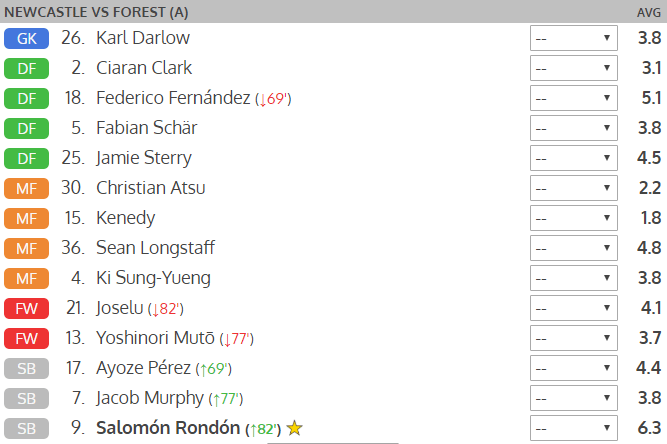 If you haven’t already put in your Newcastle v Nottingham Forest player ratings, go HERE and you can still input your own marks out of 10 for each player, then check back later to see whether the overall interactive ratings have changed for the team as more fans vote.